This professional portable power supply provides up to 180 amps of "Pulsed" DC TIG welding power at 0.99 efficiency on either 115-volt or 230-volt line power. The unit is capable of TIG welding all steel alloys from #20GA to 3/16” with standard foot pedal control and WP17 torch as well as stick electrode welding to 5/8". Package includes 115-240VAC pulsed inverter power supply, SR17 TIG torch with 12.5’ plug cable, 200-amp work clamp with 10’ plug cable, 200-amp electrode holder with 10' plug cable, foot pedal control with 16’ direct-connect cable, dual-gauge gas regulator, AK-2 torch kit and operator manual. This is the perfect high power, completely portable Pulsed DC TIG welder on the market today. This professional AC/DC TIG welder provides 200 amps of pulsed welding power for an extended 40% duty-cycle and is capable of welding all steel and aluminum alloys from #20GA to ¼” with foot pedal control. Standard unit includes auto-switching 110-240VAC input power factor correction (PFC) design for .99 efficiency and operator selectable ignition, output power, wave-forms(3), frequency, pulse rate and pre/post gas flow, SR17 TIG torch with 12.5’ plug cable, 200-amp work clamp with 10’ plug cable, foot pedal control with 16’ circular connector cable, 200-amp electrode holder with 10’ plug cable, dual-gauge gas regulator, AK-2 torch kit and operator manual. USES: TIG and/or Stick welding of steel and aluminum alloy materials in the Aerospace, Fabrication, Automotive, RV & Trailer, Petro/Chem Industries as well as general Maintenance & Repair. TOOLS: Shielding gas, welding helmet, gloves and required safety gear. WHERE: Automotive, Fabrication, Aerospace, RV & Trailer, Petro/Chem Industries as well as general Maintenance & Repair. WHY: Provides precision TIG welding of both steel and aluminum materials with very thin structure and/or varying contours in both the shop and the field. Additionally provides heavy-duty stick electrode welds without shield gas. BETTER: 200 amps of welding power at 60% duty-cycle is 25% higher than nearest competitor. Dual 115V & 230V input power allows maximum flexibility for shop and field welds. Adjustable pulse rate and frequency provide precision welds on the thinnest of materials. FEATURES: TIG welding is precision process that requires maximum power and control. Many machines do not offer complete control of the process. 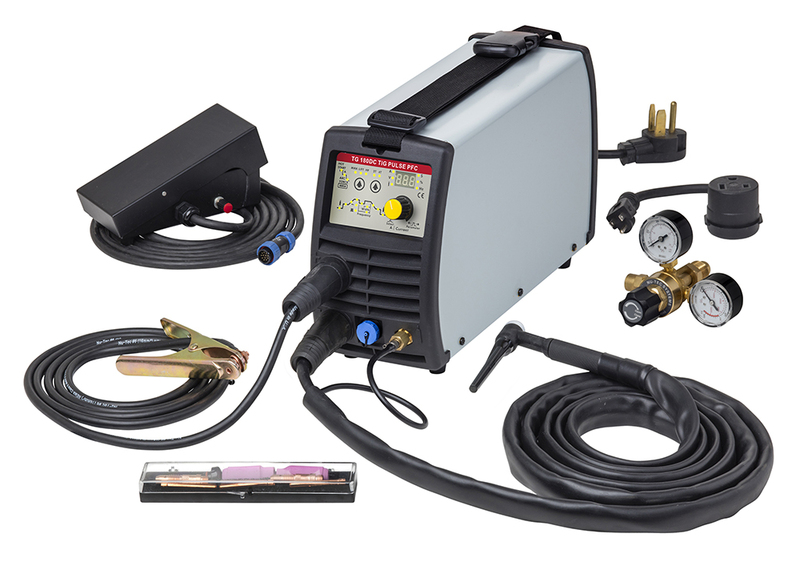 NEED: The AC/DC Pulse TIG with PFC is the perfect TIG welder for ALL APPLICATIONS. It runs on both 115V & 230V power, has complete operator control and convenient foot pedal, lots of power all in a portable (less than 36 lbs.) package. RELATED: MWCART Machine welding cart. Welding Helmet, Welding Gloves, Welding Magnets, Etc.